The Press Conference will officially launch our campaign for a No Vote in the forthcoming referendum on the EU Fiscal Compact / Stability Treaty and will be attended by Independent TD’s Luke ‘Ming’ Flanagan and Thomas Pringle who will be our guest speakers. Also Professor Anthony Coughlan, (Associate Professor Emeritus in Social Policy, TCD, and Director of the National Platform EU Research and Information Centre, 24 Crawford Avenue, Dublin 9), will attend as a guest speaker in his capacity as an expert on European Treaty Law. 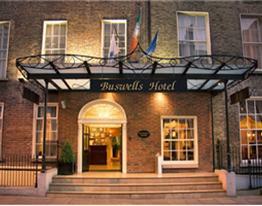 A Press Conference of our referendum campaign group, ‘Farmers for No’, is to be held in Buswell’s Hotel, Molesworth Street, Dublin, on Thursday next, May 10, at 3.00 pm in the Georgian suite. Our group is composed of past and present Officers of both the IFA and the Irish Cattle and Sheepfarmers’ Association. The Chairman of ‘Farmers for No’, is James Reynolds from Longford, who was Chairman of Longford IFA County Executive between 1999 and 2003. James Reynolds is also a former member of IFA Industry & Environment, Rural Development and Farm Business Committees and was also Chairman of the ‘Farmers for No’ to Lisbon campaign of 2009. Vice-Chairman of ‘Farmers for No’, is David Thompson from Limerick, who is a former Chairman of Limerick IFA County Executive, as well as being a member of the Campaign management team of former IFA President, John Dillon. David is also a former member of IFA Dairy and Animal Health Committees and is currently Vice-Chairman of Limerick IFA County Executive. PRO of ‘Farmers for No’, is Cllr Billy Clancy, Member of North Tipperary County Council and who is a farmer by profession. Secretary of ‘Farmers for No’, is Peter Fox from Longford, who is a former Chairman of the National Beef Committee of the Irish Cattle and Sheepfarmers’ Association and currently Chairman of Longford ICSA County Executive. Honorary President of ‘Farmers for No’, Gerry Murphy from Waterford, who is a former Chairman of Waterford IFA County Executive, a former member of the IFA National Council, a former member of the IFA Dairy and Industry & Environment Committees as well as being a former member of the IFA Rules and Privileges Committee. To date in this short referendum campaign the debate on the EU Fiscal Compact / Stability Treaty has been primarily based on party political considerations and an over eagerness on the part of those in the Yes campaign to submit unquestioningly to EU diktat even to the point of grossly misrepresenting the facts about this Treaty and misleading the public of the effects on Irish society and the economy of it’s ratification. Firstly let me indulge your desire for information on what the likely consequences of that ratification would be for this country and indeed for the Family of European Nations. On May 31 the Irish People will have the choice to accept or reject the “PERMANENT Austerity Treaty”, also known as the EU Fiscal Compact Treaty or Treaty on Stability, Coordination and Governance in the Economic and Monetary Union. By accepting this Treaty we would be PERMANENTLY handing over ABSOLUTE control of Fiscal Policy or the ability of elected Irish Governments to frame our own Budgets, to the NEW ‘Troika’ of the EU Commission, ECB and European Court of Justice. This handing over of ABSOLUTE control of Fiscal or Domestic Taxation Policy will result in even MORE POWER FOR UNELECTED TECHNOCRATS IN BRUSSELS AND LUXEMBOURG. The Fiscal Compact Treaty gives wide-ranging powers to the UNELECTED EU Commission and EU Court of Justice. Failure to implement the strict austerity conditions will result in the ECJ imposing fines of 0.1% of GDP or approximately €200 million per annum in the case of this State. This is nothing less than a Power grab by the UNELECTED Brussels based elite that controls EU Policy, which would mean if the Treaty is ratified, a PERMANENT SURRENDER OF THE LAST VESTIGES OF OUR NATIONAL ECONOMIC SOVEREIGNTY instead of regaining that economic sovereignty that has been already ceded by way of allowing the ‘Troika’ to dictate our current Fiscal Policy on a temporary basis because of the disastrous ‘Bank Guarantee’ enacted by the previous discredited Fianna Fail/Green Government. In other words, the Irish People are being asked by those advocates of a Yes Vote to exchange the temporary surrender of our economic sovereignty by way of the handing over of effective control of our Fiscal Policy to the ‘occupying power’ of the ‘Troika’ of the EU Commission / European Central Bank and IMF for a PERMANENT surrender of our economic sovereignty to the New ‘Troika’ of the EU Commission / ECB and European Court of Justice! This ‘AUSTERITY’ Treaty is ONLY for the Irish People and NOT for Foreign Banks and Bondholders, who are EXEMPT from any austerity despite the fact that the EU has imposed a massive 50% writedown on the Bondholders of Greek debt. The Fiscal Compact policies of Austerity would kill demand and economic growth that is so necessary for the recovery of our economy and at the same time those policies would result in the closure of Regional Hospitals, Rural schools and Garda stations. The Fiscal Compact would also ensure that current and future generations of Irish tax payers would pay every last cent plus interest to the ECB, for that loan obtained by the previous discredited Fianna Fail/Green Government, to reward the Foreign Bondholders of Irish Bank Debt. But what happens if we Vote No? Could Ireland’s access to a future bailout from the ESM Rescue Fund be put at jeopardy by that decision? This is the so-called ‘Blackmail Clause’ contained in Article 136 of the European Stability Mechanism. Firstly the ESM Treaty has not yet been ratified and there is a Legal challenge being brought against it’s ratification by Independent TD, Thomas Pringle. Secondly the ESM Bailout Rescue Loan Fund does not yet exist. Thirdly the ESM Rescue Fund is a Loan fund that does not provide us with FREE money. Fourthly the ESM Treaty requires Ireland to contribute €11.1 Billion to that ‘Rescue’ Fund, which we must BORROW with €1.5 Billion of that BORROWED to be paid upfront. Fifthly and most importantly the ONLY reason that we ‘need’ a ‘Bailout’ is because Ireland is locked out of the financial markets for borrowing because Irish Sovereign Bonds carry a high risk of default as a direct result of the ‘Bank Guarantee’ of the previous Fianna Fail / Green Government that was the means of the Irish Tax payer BAILING OUT FOREIGN BONDHOLDERS who invested in the now bust Anglo-Irish Bank when gambling on the continuation of the ‘Building Bubble’. The forthcoming Referendum on the EU Fiscal Compact Treaty must be a plebiscite on the UNJUST BANK DEBT. If the Irish People Vote No on May 31, this democratic decision must be respected and must be a MANDATE TO DEFAULT ON THE UNJUST BANK DEBT BURDEN THAT IS SINKING OUR ECONOMY. It is the loading of this ‘Bank Debt’ on top of the country’s Sovereign National Debt that is preventing Ireland from borrowing on the financial markets at low interest cost. Defaulting on this UNJUST BANK DEBT would enable Ireland to borrow funds on the financial markets by selling Irish Sovereign Bonds at reasonable interest cost and avert any risk of the country depending on a yet to be created ESM Rescue Fund that could be denied to the country because of our correct decision to reject the Fiscal Treaty. Also the decision to Default on the Unjust Bank Debt would enable this country to exit the current ‘Bailout’ programme overseen by the ‘Troika’. It is also our contention that Ireland’s economic interest would be best served by Exiting the Euro-zone that has had such a catastrophic impact on our economy and society since we joined the failed currency zone in 1999. Within one decade of Ireland joining the Euro-zone in 1999 and ditching the successful floating Punt, our Pre-Building Bubble economy had been transformed from one that was thriving and was the envy of other countries to the basketcase that it is today. There is no doubt but that Ireland’s decision to enter the one size fits all Euro-zone in 1999 was the principal contributing factor to the Housing Bubble which in turn Crashed the Economy. This was caused by the destruction of National Currencies and the removal of exchange rates which enabled European Banks and most especially German Banks to engage in a lending splurge to Irish Banks which in turn re-packaged these loans into House Mortgages and Property Loans. Also because we joined the Euro-zone the ECB lowered interest rates which further FUELLED House prices and saddled young families with UNAFFORDABLE MORTGAGE DEBT while at the same time condemned a large proportion of our population to the open prison of wholesale housing stock in negative equity. Also at the Beal na mBlath oration, Michael Collins commemoration, 22/08/2011, as quoted in the Irish Times, Professor Edward Walsh, founding President, University of Limerick, said that : “Ireland entered the euro in 1999 and lost control of the two vital monetary instruments : setting interest rates and setting currency exchange rates. Had Ireland remained outside the euro, it’s bankers would not have gained access to the euro zone’s vast and low interest borrowing opportunities. 1) Guaranteed funding of the CAP Budget Post – 2013 that is so necessary to protect the solvency of the Irish Family Farm model of Agriculture will be seriously undermined as the EU will dip into the CAP Budget in order to secure sufficiency of funding for the ESM Rescue Fund that requires in excess of €700 Billion. This view is supported by Alan Matthews, Professor Emeritus of European Agricultural Policy, Trinity College Dublin, on the EU Summit of December 9, 2011 that decided on the €700 Billion ESM Rescue Fund. “Safeguarding the CAP Budget must be increasingly in doubt after last week’s fateful EU Summit”. 2) Prices for food and agricultural products will be likely to fall due to austerity throughout our export markets in Europe. Again this view is supported by Professor Matthews, who also said in that December 15 article in the Irish Examiner, that : “The growing likelihood of an EU recession next year, possibly inducing further economic turmoil beyond the continent, will lower demand for agricultural output and could lead to another collapse in output prices”. Also Professor Matthews said in capreform.eu blog that : “Difficulties in Europe’s banking sector will curtail credit to farmers and to the small and medium-sized enterprises which make up the bulk of the EU’s food industry …the EU’s prized single market in agricultural and food products could come under threat”. 3) Taxes will continue rising because of bailing out foreign banks and bondholders. 4) Irish Government contribution to EU Co-financed direct payment schemes such as the Disadvantaged or Less Favoured Areas Scheme will be reduced or withdrawn altogether thus collapsing such a scheme that provides a necessary ‘safety net’ for low income farm families in geographic disadvantaged areas. 5) Farm Family members working in off-farm employment will have their wages and salaries cut even more because of enforced austerity. 6) Social Welfare payments to farm families, such as old age pensions will have to be reduced and Income supports such as Farm Assist will be likely to be scrapped because of enforced austerity. ‘Farmers for No’ are very critical of the larger farming organisations, namely the IFA, ICMSA, Macra na Feirme and ICOS for their failure to allow democratic discussion and debate amongst their grassroots members before making a considered decision on the Fiscal Treaty. ‘Farmers for No’ will be vigorously putting forward the case against the Fiscal Treaty in terms of the devastating impact that the Treaty’s ratification would have on the Family Farming in Ireland and the Agricultural Sector, which is so vital for the country’s economic recovery. However ‘Farmers for No’ will also vigorously put forward the case for a No Vote because of the Treaty’s devastating impact on the wider economy as farm families are also consumers and are integrated into the wider economy and society with many farm family members working in off-farm employment or seeking work off-farm. Also as austerity is having a negative impact on consumer consumption of food products that the agricultural and food industries depend on as a market for farm products, it is crucial that the Fiscal Treaty, which would result in PERMANENT austerity, is rejected. 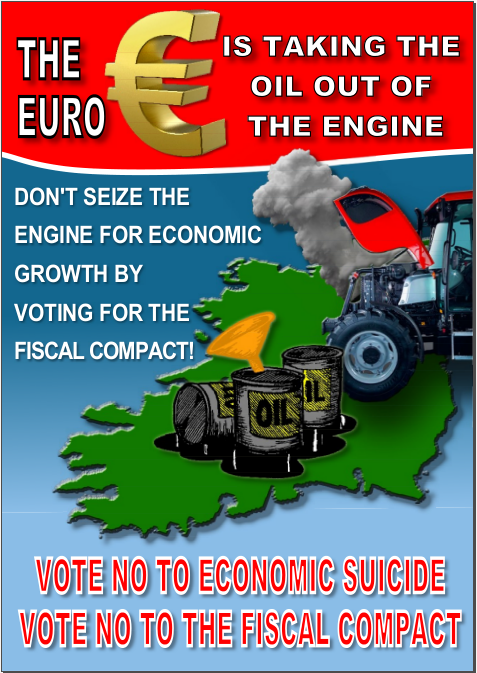 Over the next few weeks ‘Farmers for No’ intend to drive home the message that the EU Fiscal Compact Treaty must be rejected if we as a nation are to have any hope of achieving economic recovery and create a roadmap for a prosperous future for all of the Irish People. In light of the recent developments with the election of the new French President, Francois Hollande, the collapse of the Dutch Government and the rejection by the Greek people of the ‘Merkozy’ Austerity agenda in Sunday’s General Election in Greece, our task must be a lot easier as it is apparent that the peoples of Europe are looking for the Irish People to lead in formally rejecting the Fiscal Compact as we are the only EU Member State that is having a Referendum on the Treaty.